Location-based ad targeting means more relevant content for consumers, higher ROI for brands, and more revenue for publishers. In order for location data to be actionable, it must be both accurate and precise. Let’s first start by defining the two terms and how they are different. Precision means exactness. In simple terms, precision is how small of a pin you put on the map. It is the difference between placing a user at 41 Farnsworth Street, compared to placing the user somewhere on Farnsworth Street, compared to placing the user somewhere in the Innovation District of Boston. Precision is a mathematical term, and we express it using latitude/longitude. The more decimal places you have the more precise it is. Accuracy is where we fix a position relative to ground truth. It is how close the position is to reality. This is where we talk about horizontal positioning error. If we place the user at 41 Farnsworth Street, that is being really precise, but the accuracy may not be right because the user might actually be at 289 Summer Street, which is 5 blocks away. What Happens When you Don’t Have Both Precision and Accuracy? If an advertiser has a location with more than 4 decimal places, 101.593278, it is really good precision but if the user is far away it’s not accurate. When you assume that you have accurate location because you have great precision, you are assuming you have good overall location, when in reality it is incorrect and inaccurate. This assumption results in missed opportunities to use accurate and precise location to understand where your users actually are and to better target to them with relevant content - not to mention the costs that can pile up when advertisers pour cash into targeting for a specific location and that location is inaccurate, rendering the campaign ineffective before it even has the chance to run. For example, if a user is grocery shopping at the Whole Foods in Portland, Maine, but his location is taken with a horizontal positioning error of 1 km, it could falsely place the user at a gym in Portland. Advertisers are going to mistarget consumers if their fundamental assumptions about the consumer are wrong. How Can You Ensure That You Are Getting Both? As the creator of the hybrid positioning system, Skyhook scans and processes billions of Wi-Fi access points, cell towers and IP, each address complete with GPS coordinates. We never take a single location signal at face value. We always combine and cross-reference all available location signals using our patented technology. Source - In the adtech industry, IP address is the standard source of location data, but it is often incorrectly positioned by IP location providers. These providers rely on Internet topology to assign large blocks of IP addresses to postal code centroids. We request IP address from you so we can reposition it, if necessary. Native location from users’ mobile devices is preferable because it’s typically sourced from GPS and Wi-Fi. Recency - Whenever possible, Skyhook differentiates between the timestamp of an ad request and the timestamp of the last location scan by the device receiving the ad request. The same location observation is often used for many ad requests on the same device, resulting in many duplicate location samples. This is why we ask for our customers to collect and submit the timestamp of the location observation. Reliability - Our system devalues lat/longs with 7 or more decimal places, because that level of precision requires differential correction methods not found in typical mobile devices. Too many decimal places in a lat/long indicates the location may be fabricated. Skyhook generates user Personas by mapping location samples to venues. In doing so, we require a level of precision in the location logs our customers submit. We require four decimal places of precision in lat/longs so that we can determine when someone is in a venue. Any fewer decimal places, and a user could be down the street from a venue, somewhere else in the same city, or in another country altogether. 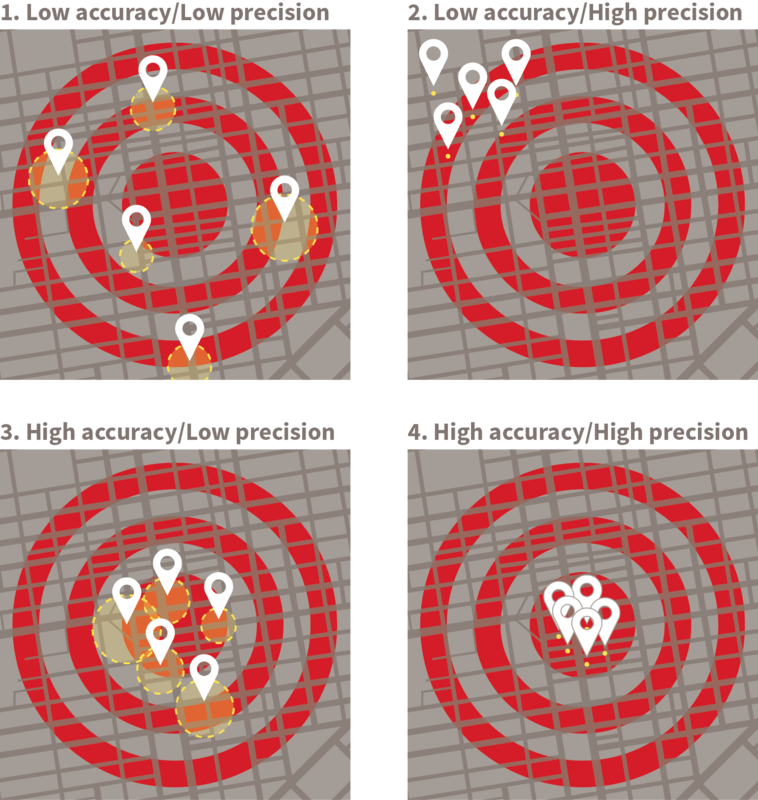 When it comes to location, it is not enough to have just precision or just accuracy. As we demonstrated, there is a significant difference between the two, and having both location accuracy and precision helps to determine the best location possible for your campaigns, and to leverage this information for enhanced user intelligence in the form of Personas. To learn more about Skyhook's location technology, visit the Precision Location page.